Regular Sized: 11" x 17", Tons of Heroes 100% Splash - Justice Society of America: Wildcat, Flash [Jay Garrick], Dr. Fate, Green Lantern [Alan Scott], Dr. 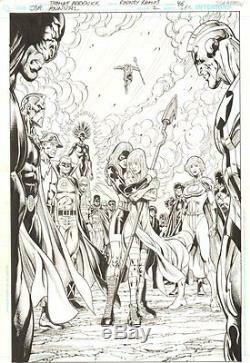 Terrific, Stargirl, Hourman, Power Girl, Magog [David Reid], & Others - 2010 pencils by Tom Derenick and inks by Rodney Ramos. PLEASE SEE MY ABOUT ME PAGE FOR 1000'S OF PICTURED ART PAGES AVAILABLE. See ABOUT ME for 1000's of original art pages in stock. The artwork pictured are all one of kind originals unless otherwise described. The item "JSA Annual #2 p. 46 Tons of Heroes 100% Splash 2010 art by Tom Derenick" is in sale since Thursday, February 27, 2014. This item is in the category "Collectibles\Comics\Original Comic Art\Interior Pages". The seller is "anthonyscomicbookart-online" and is located in Leonia, New Jersey. This item can be shipped worldwide.